What's the old saying? I scream, you scream, we all scream for ice cream? Well, no screaming is actually involved unless it's from the excitement of having a vintage ice scream tricycle show up at your event. 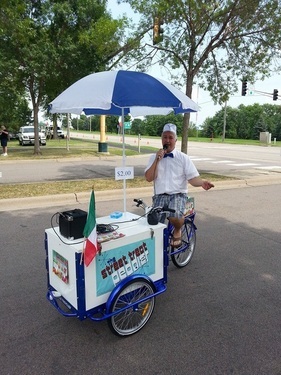 Your guests will love the look, tastes and sound from the only crooning ice cream man around! From a vintage style tricycle, I will peddle around handing out delicious ice cream novelties to your guests. And don’t forget the music – I will be playing the instantly recognizable music from the ice cream man, but with a twist - I will also be sprinkling in some live singing of hits from the rat pack era! I specialize in singing the songs made famous by legends such as Frank Sinatra, Nat King Cole, Dean Martin and many more! 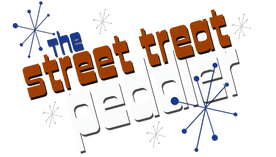 Add a ridiculously unique feature to your next event by hiring me - The Street Treat Peddler! Pricing varies depending on on quantity, treats, etc. Please contact me for a customized quote.